I promise I have been working on a real actual blog post (actually 2 of them) since last Thursday but with going home to NY this past weekend and then a new girl started at work yesterday and we had an in-service today, I kinda lost all of my “free time” for finishing blog posts lol. BUT stay tuned within the next day because I promise to have it done AND I am working on a Toy Story 3 review post too. I decided I’m not going to post that one til Fri though (most likely) because I want to give people more time to see it. OHHH! If in case you didn’t know already, I choose a wedding dress on Saturday! I went to Fantasia Bridal in Rocky Point, NY and if you’re reading this from Long Island, definitely check that out because they are so fantastic there. They give you suggestions but don’t force anything on you at all. I cannot recommend them highly enough. I really love my wedding dress and I wish the wedding was tomorrow so I could show everyone my dress haha. The best part is that the sample size fit me, so I won’t have to really lose any weight. I can’t gain any lol but I won’t have to extreme diet either. YAY. So thus said, I’m doing one of those every-so-often PostSecret posts. This one from last Sunday really made me cry like it was the second-to-last-scene of (SPOILER ALERT) a certain Pixar movie. 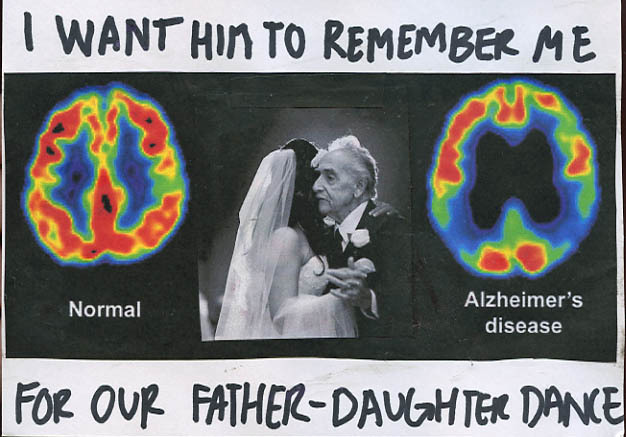 I really hope whoever sent that Postcard in gets her perfect father-daughter dance. P.S. CONGRATULATIONS to my dear friend Rachel & her husband Will on the impending arrival of their baby girl, who Facebook tells me will be named Hannah. <3 Love you guys! Substitute ‘Red Sox’ for ‘Padres’ & Still No Winner! This entry was posted in PostSecret, Weekend and tagged Fantasia Bridal, PostSecret. Bookmark the permalink.